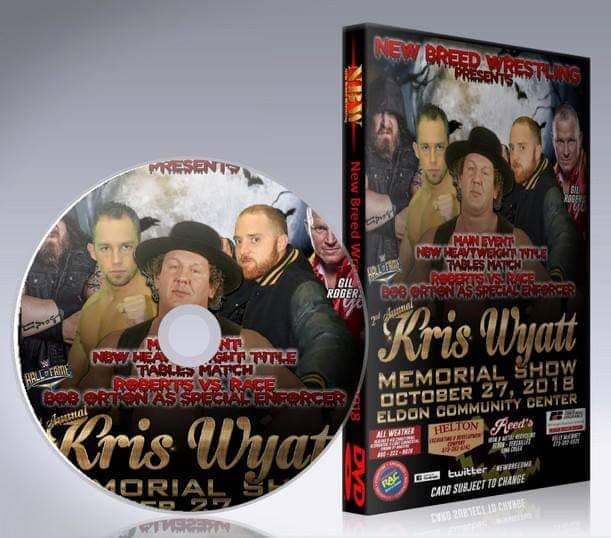 Have you always wanted to own a copy of the New Breed shows? Now you can, starting with our event from this past October in Eldon! For the low price of $10, you can see the NBW debuts of Alpha Omega and Gil Rogers, plus Kyle Roberts vs. Leland Race in a Tables Match for the Heavyweight Title and more! Pre-sales are available now by messaging us directly here at our Facebook page. Once we have enough pre-sales, we will then put the DVD in production and have more available at our shows. If you guys are interested in these, we will go through our past shows and print them, plus have them available on our future shows too! Message us today so you can reserve your copy! This entry was posted on February 3, 2019 at 1:33 pm	and is filed under Uncategorized. Tagged: Kris Wyat, NBW, New Breed Wrestling. You can follow any responses to this entry through the RSS 2.0 feed. You can leave a response, or trackback from your own site.